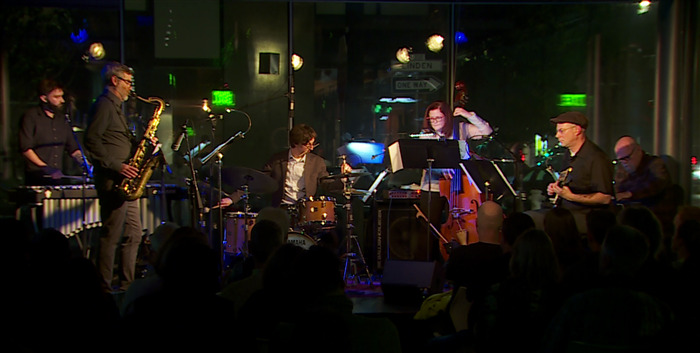 Bay Area bassist and composer Lisa Mezzacappa and her sextet perform a suite of original music inspired by Italo Calvino’s funny, imaginative, gloriously nerdy Cosmicomics stories. Mezzacappa intersperses readings from Calvino’s stories with her inventive compositions, which feature rollicking grooves, layered melodies and thrilling interaction by the virtuoso improvisers in her band. The group has recently performed at the Monterey Jazz Festival, Angel City Jazz Festival, and SFJAZZ Center. Come welcome these fantastic and imaginative musicians in their San Rafael debut! avantNOIR: Army Street from Lisa Mezzacappa on Vimeo. avantNOIR, a suite of compositions for jazz quartet plus guests, is a musical companion to the crime novels of Dashiell Hammett and Paul Auster. All music by Lisa Mezzacappa. avantNOIR: A Bird in the Hand from Lisa Mezzacappa on Vimeo. avantNOIR: Fillmore Street from Lisa Mezzacappa on Vimeo.